Tom Eckert and his wife Sheri, both Oregon-based psychotherapists in private practice, have long-sought to take a different approach to therapy. The only problem: The drug they want to use to help treat anything from depression to nicotine addiction is illegal. For the past three years, Eckert, co-founder and lead petitioner of the Oregon Psilocybin Society, has worked to build a coalition that aims to decriminalize psilocybin, the psychedelic compound found in more than 200 mushroom species. “Like millions of Americans, I’ve had some pretty profound experiences at different points in my life with psychedelics,” Eckert said. The initiative, which received approval from Oregon’s Secretary of State last December, has moved into the petitioning stage. According to Eckert, they currently need 112,200 more signatures by July 2020 to get on the ballot for that year. 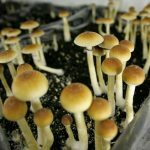 “My wife and I were motivated by the amazing body of research, which shows that psilocybin-assisted therapy is safe and uniquely effective when addressing issues like depression, anxiety, PTSD and addictions, including alcoholism and cigarette smoking,” Eckert said. In Denver, an initiative similar to the OPS’s did not make it onto the 2018 ballot after failing to get approved by the Denver elections division. That same year, the California Psilocybin Legalization Initiative made it past the approval step, but only gained 25 percent of the signatures needed to make the ballot, according to the initiative’s Facebook page. In October 2018, researchers at Johns Hopkins University published a study indicating that psilocybin could be therapeutically beneficial with little risk of abuse. Based on the findings, researchers suggested reclassifying the drug from a Schedule I, which indicates a drug has zero medical uses, to a Schedule IV, indicating little risk of abuse and potential medical value. Under the proposed initiative, psilocybin would still be illegal for recreational use. However, McMain also notes that research is still in the early stages. “More research still needs to be done to determine additional potential medical benefits and find the specific conditions required to use psilocybin therapeutically under a specialist’s care,” McMain said. The road to regulated psilocybin is a long one for researchers, who are looking for more than changes in state law. While Eckert said that decriminalizing psilocybin will give researchers increased access to the drug, McMain remains skeptical. “Decriminalizing psilocybin in one state won’t make research any easier because the research is still regulated by the feds,” McMain said. The study mentions that even though psilocybin is relatively less harmful than other drugs, researchers still don’t recommend its recreational use — even with a prescription. The conditions for medicinal use should be tightly controlled with supervised administration in a healthcare setting. Recreational use of mushrooms is known for its hallucinogenic properties, but the United States Drug Enforcement Agency warns that abuse of psilocybin can result in psychosis, panic attacks, lack of coordination or death. The sessions would include assessments and preparation, before the psilocybin would be administered by a licensed caregiver. Chairman of the University of Oregon’s College Republicans, Quinn Milionis, says that while he’s pro-decriminalization, the initiative’s real goal is eventually full legalization. Milionis says that full legalization could potentially encourage people to use substances they wouldn’t have used otherwise. “It’s important to look down the line and be wary of what could potentially happen in the future,” he said. Charleen Justice, chapter leader of the UO’s Students for Sensible Drug Policy group, encourages students to educate themselves on the proposed bill before making quick decisions. While they haven’t picked a venue yet, Eckert and PSI plan to bring Anthony Bossis, the lead researcher for a psilocybin study at NYU, to speak in Eugene on May 23. Students can find out more at the campaign’s official website psi-2020.org.